Diabetes Arthritis / Charcot Disease of the Foot. What you need to know. Charcot Disease of the foot. There is a kind of joint disease found almost exclusively in sufferers of diabetes called Charcot’s disease. It occurs when the sensory nerves that supply a joint lose their ability to report the joint’s position back to the brain effectively. The brain is then unable to sense when the joint is being used incorrectly. For example, the bones forming the joint may be moving too fast through their range of motion without the muscles that control them being called in to ‘put the brakes on’, as would usually occur. This can result in the joints being put under unmanageable pressure and destroyed. Initially, the foot will appear completely normal. As it develops, the foot may have significant amounts of soft tissue swelling and colour changes. It may then become hot and swollen though it is usually not painful. 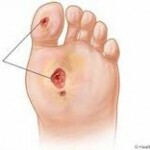 It is commonly considered a diabetes arthritis. The picture opposite shows a normal foot X-Ray on top and a Charcot Joint on the bottom. The most common type of Charcot’s disease has the structure of the arch give way at the midpoint. The bones of the mid-foot become prominent in the arch. This creates mid foot pressure areas where none were present before. It is obvious too that the joints will not allow movement in the same way and the foot becomes stiff and fixed in place. How quickly can Charcot Foot or Diabetes Arthritis develop ? While the reduction in sensation that sets up this dislocation is progressive, once the tissues that bind the joints in place are disrupted, the dislocation will occur very quickly, in just a few steps. Other possible results include rampant spurring of joint surfaces, loss of bone strength, other dislocations, fractures and fragmenting bones. Due to the neurological nature of the condition, it is not painful. Charcot’s disease results from nerve disorders particularly diabetic neuropathy but also including leprosy, alcoholic neuropathy, syringomyelia, or other conditions that compromise the spinal cord. The condition is characterised by hypermobility and instability of the joint, both of which allow too much movement. Charcot’s disease comes about because of the loss of pain sensation. This robs your body of the automatic protection you get when your brain is able to keep you away from performing painful actions. A good way to think of how it happens is this. Imagine that you went to the gym and used a heavy hand weight to do arm curls. If, instead of using it properly, you flung it out to the full extent that your elbow could straighten to, over and over again, it would start to hurt. Throw in the absence of sensation inside the joint and your body will let you do this with each and every step. That is how Charcot’s disease comes to destroy a joint. Charcot’s Disease can be interrupted before damage occurs. Firstly, if you have diabetes, see a podiatrist and find out if you have neuropathy. People who do will often not know, as anaesthetic neuropathy is a silent and painless condition. If the podiatrist finds that your sensation is diminished, you should wear orthotics to stop your joints from being able to move to the ends of their ranges of motion while you walk. Protecting your feet this way will go a long way to deferring the onset of destructive joint forces. Our Peripheral Neuropathy Info Sheet has more information about this condition in general. With diabetes, the most common structural problems in the feet include the following. Retracted or clawed toes, bunions, prominent metatarsal heads (the knuckles on the bottom of the ball of the foot) and areas of increased pressure that lead to corns, callus or ulceration. Those with diabetes can suffer from glycosylation of the collagen. This means that the abnormally high blood sugar causes the soft tissue – things like skin, muscles and joint capsules – to stiffen up and contract. Toes may become deformed. The bouncy fat beneath the skin may also thin down which makes the skin more easy to damage. All feet take a lot of pressure in daily life and structural issues like these can increase that pressure by a factor of 500% in some places. This can create pressure areas where the skin may break down or become ulcerated. Podiatrists make shoe inserts that can either make the foot function better or deflect the pressure away from problem areas, preventing or healing ulcers. To access the downloadable / printable version of our collected Diabetes and your Feet articles, please browse to our Diabetes Info Sheet.